Lakefront Cottage with Amazing Views in an Ideal Location! Any season of the year, ever-changing Lake Erie provides the entertainment while your make memories in this charming cottage. Because we love spending time here, we have completely remodeled this historic cottage adding all the comforts of home. Past guests tell us that the clean, comfortable house and proximity of the lake exceed their expectations. The panoramic views of Lake Erie from the kitchen, living room and dining room are amazing. Upstairs are 3 private bedrooms and open loft with original hardwood floors and an updated full bathroom. The lakefront deck and large yard invite guests outside and a fire ring is located at the water's edge. Watch bald eagles, purple martins, cranes and ducks from inside or out. You can fish or swim from the property using large stepping stones or a set of stairs. Meticulously maintained and cleaned by the owners, the house is nicely furnished with special attention to bedding, linens, bath and kitchen so you feel right at home. We rent to non-smokers over 25 years old. We want others to enjoy Lake Erie when we cannot be here. Located on a private lane. A sandy, state nature preserve beach is within walking distance and a mile-long public sandy beach is 2 miles away. Explore many other nearby Lake Erie beaches using the State of Ohio guide to beaches. Budget Travel rated Huron, Ohio one of America's Coolest Small Towns in 2015. 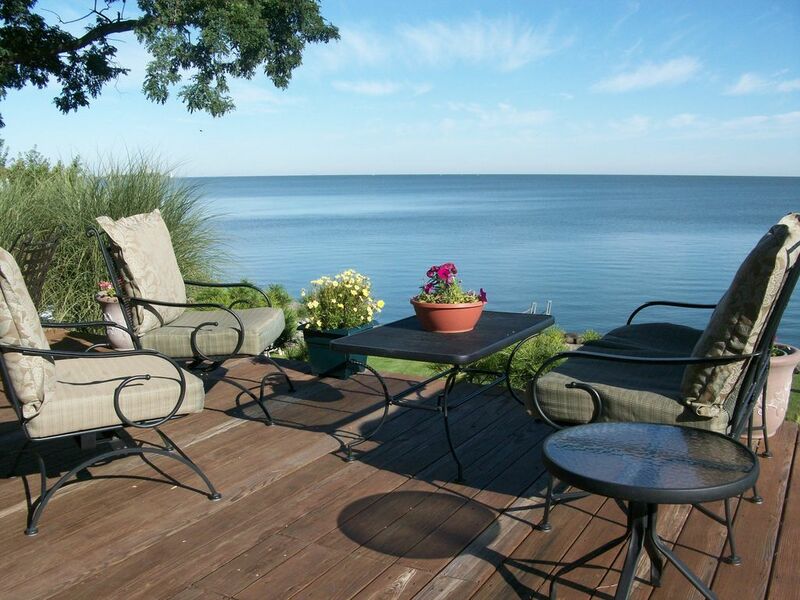 Conveniently located one hour from Cleveland, 20 minutes from Cedar Point and 35 minutes from Marblehead. The owners met here in Hartley Beach and have been married ever since. Now living in Columbus with jobs that keep us much too far from Lake Erie, we love spending our free time here. We chose to buy this cottage because of our family and great neighbors who live on this private lane of a dozen houses. It is truly special to find the friendly vacation atmosphere that this neighborhood has. Lake Erie is a powerful attraction that you have to experience to understand. Year round, this is our idea of a get away! On site water access for swimming and fishing. Many board games and puzzles. Bocce ball and horseshoes. Outdoor fire ring and outdoor gas powered fire pit, indoor fans in every room, outdoor fan, USB chargers in every room, yoga mat, Britta water filter pitcher. We had such an amazing time staying in this lovely. Amazing view of lake Erie. We did a lot of fishing and birdwatching while there - I saw a bald eagle catch a fish as the sun was setting, pretty amazing stuff. Rooms and beds were great - and the kitchen had everything we needed. The town of Huron was also very cute with good shops and places to eat. Our family also went to two different local nature preserves and saw great wildlife. Already thinking about booking for next year! My husband and I had a really great time. The property is well kept both inside and out. The view is exactly as described-AMAZING! We saw the eagles daily. Kitchen had everything we needed, including chilled beer glasses in the freezer(they really did think of everything). Nicely decorated and bed was very comfortable. The hosts were very kind and accommodating. Thanks!!! Cozy lakefront home with beautiful views! A beautiful place with all the comforts of home! The kitchen was well stocked with everything we needed after we were snowed in due to winter weather. We really enjoyed the fireplace and the stunning lakefront views, including bald eagles. Karen was extremely helpful, gracious and accommodating when bad weather required us to extend our stay by an extra night. The home was very clean and updated throughout. I would definitely recommend this home and hope to visit again! Very homey. Everything you could possibly need is a available. Wonderful! We didn't want to leave the cottage. Clean, nicely decorated and comfortable furniture and beds. The views of the lake are beautiful. We will return and recommend to our friends. Very clean and comfy, lots of sweet little touches that made us feel at home. We had a 3 days girls (cousins) weekend. The weather was pretty chilly but we didn't let that ruin anything. Lots of deck sitting and eagle watching wrapped in blankets and coffee or wine in hand. The house was just perfect with all the necessities of home, and the view was breathtaking! Very nice, quiet neighborhood too. Old woman creek state nature preserve offers a beach, nature trail and museum within walking distance. Cleaning charges may be added for stays less than one week or for large groups.